One-of-a-kind farm in Wilson County, This is a prime investment farm, Consisting of 200 acres of farmland, 147.8 acres of timber, 3,750 +/- feet of road frontage, and two access paths, Located in very close proximity to Highway 301, Highway 795 and I-95. 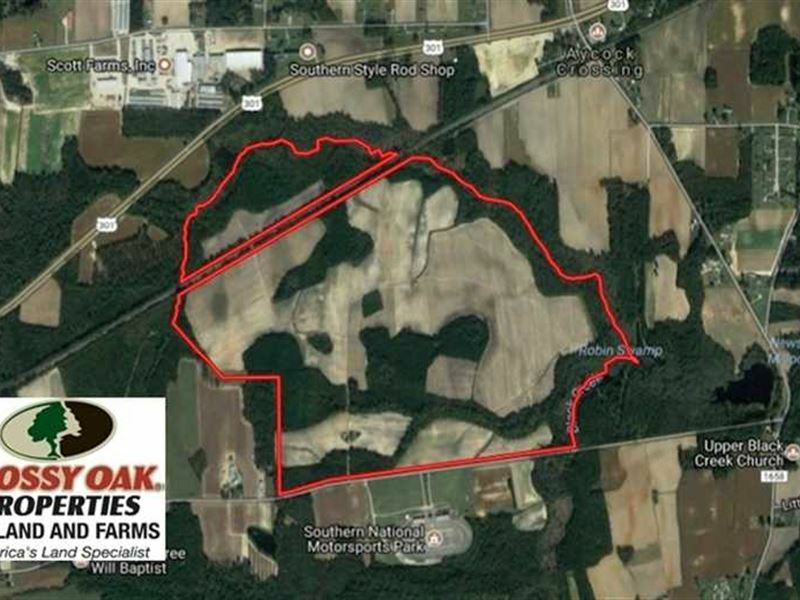 347.8 Acres of Farm and Timber Land For Sale in Wilson County NC, You don't find farms like this often, Located just outside of Lucama and minutes from Wilson, this property boasts 3,750 feet of road frontage, right at 200 acres of prime agriculture land that is fantastic for tobacco and and sweet potatoes. There are over two miles of well maintained paths that allows access across all areas of the property, including a private access that crosses the rail road tracks to a secluded 40 acre parcel. The development of the road frontage, managed timber, and large acreages of highly productive soils makes this property a prime investment opportunity. There is a ton of wildlife on the property as well. Black bear tracks, white tailed deer, and turkey sign was spotted along the field edges, especially the eastern portion of the property which borders Robin Swamp and Black Creek. There are a few waterholes and creeks that makes for fantastic waterfowl hunting as well see aerial photos. For a birds eye view of the property visit our MapRight mapping system. Simply copy and paste this link into your browser com/ranching/maps/14525c6befdaca0ef7a1f36fc/share and then click on any of the icons to see photographs taken from those exact locations as well as drone photos taken from the air. Click around and change the base layers to view shaded relief or hydrology maps of the area. This property is shown by appointment only for serious and qualified potential buyers only. Please call ahead to schedule a showing.